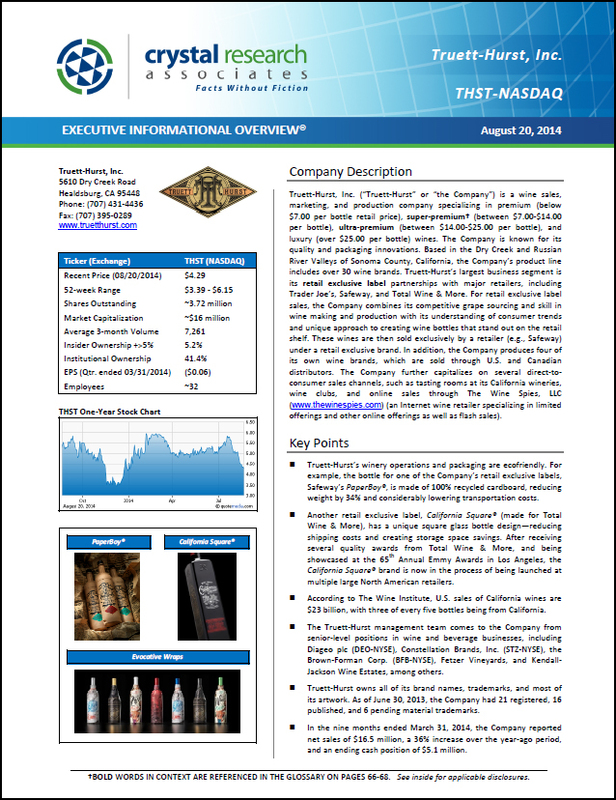 Crystal Research Associates has released a 16-page Quarterly Update on Truett-Hurst, Inc. (THST-NASDAQ). Truett-Hurst is a wine sales, marketing, and production company specializing in $7.00 to $50.00 per bottle wines. The company is known for its quality and packaging innovations. Based in the Dry Creek and Russian River Valleys of Sonoma County, California, its product line includes over 30 wine brands. Truett-Hurst’s largest business segment is its retail exclusive label partnerships with major retailers, including Trader Joe’s, Safeway, and Total Wine & More. For retail exclusive label sales, the company combines its competitive grape sourcing and skill in wine making and production with its understanding of consumer trends and unique approach to creating wine bottles that stand out on the retail shelf. These wines are sold exclusively by a retailer (e.g., Safeway) under a retail exclusive brand. The company also produces four of its own wine brands, which are sold through U.S. and Canadian distributors. Truett-Hurst further capitalizes on several direct-to-consumer sales channels, such as tasting rooms at its California wineries, wine clubs, and online sales through The Wine Spies, LLC (www.thewinespies.com) (an Internet wine retailer specializing in limited offerings and other online offerings as well as flash sales). Nov. 10, 2014 /PRNewswire/ -- Truett-Hurst, Inc. (THST-NASDAQ) yesterday reported results for its first quarter fiscal 2015 ("FY15"), which ended September 30, 2014. Truett-Hurst, Inc. operates an innovative and fast growing super-premium and ultra-premium wine sales, marketing and production company based in the acclaimed Dry Creek and Russian River Valleys of Sonoma County, California. 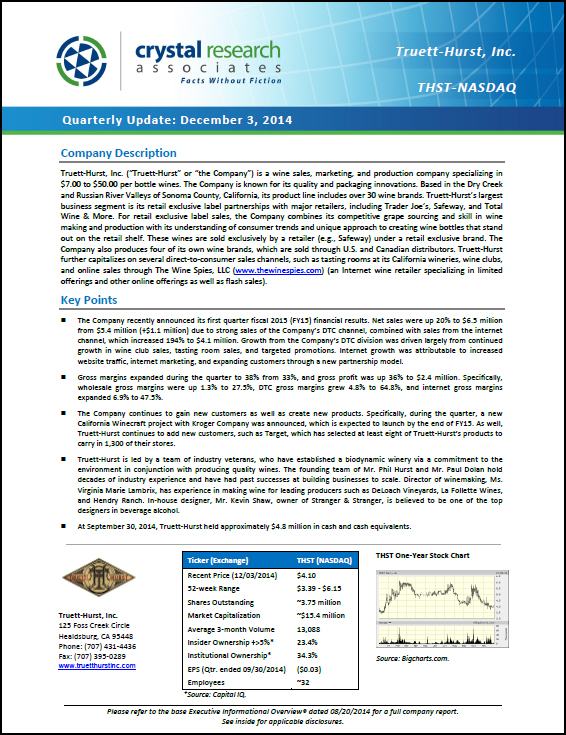 At 1:00 PM ET, join Truett-Hurst, Inc. (THST-NASDAQ) conference call and webcast for fiscal 2014 results. The winemaker announced that it will conduct a conference call to discuss its fiscal 2014 results for the period ended on June 30, 2014, on Friday, September 26, 2014 at 10:00 a.m. Pacific Time / 1:00 p.m. Eastern Time. The company's fiscal 2014 results for the period ended on June 30, 2014, were reported on September 25, 2014, prior to this call. The call is open on a listen-only basis to any interested parties and will be hosted by Mr. Phillip L. Hurst, Chief Executive Officer, and Mr. Paul Forgue, Chief Financial Officer and Chief Operations Officer. Truett-Hurst Inc. (THST-NASDAQ) announced this morning that it will release ready-to-drink wine-based beverages in cans under the brand California Winecraft through Kroger’s supermarkets and multi-department stores. Kroger, one of the world's largest retailers, serves customers in 2,638 supermarkets and multi-department stores in 34 states and the District of Columbia under two dozen local banner names: Kroger, City Market, Dillons, Food 4 Less, Fred Meyer, Fry's, Harris Teeter, Jay C, King Soopers, QFC, Ralphs, and Smith's, among others. This particular line of products offers new flavor and packaging alternatives. Headquartered in Healdsburg, California (Sonoma County wine country), Truett-Hurst's California Winecraft line of products adds to its current line of packaging innovations, which includes: California Square, PaperBoy, and Wrapped Wines. The California Winecraft line of wine-based beverages is flavored by unique recipes developed by in-house winemaker, Ms. Virginia Lambrix, with the cans bringing easy accessibility to some popular wine-based drinks, such as Sangria, Calimocho, and Wine Spritzers. California winemaker Truett-Hurst, Inc. (THST-NASDAQ) has announced that, starting Fall 2014 and Spring 2015, beverage retail company Total Wine & More will be adding more of Truett-Hurst's new wines to its retail selection. This news follows Truett-Hurst's announcement last month that grocery retailer Safeway was also adding moreTruett-Hurst wines to its listings, starting in September 2014.